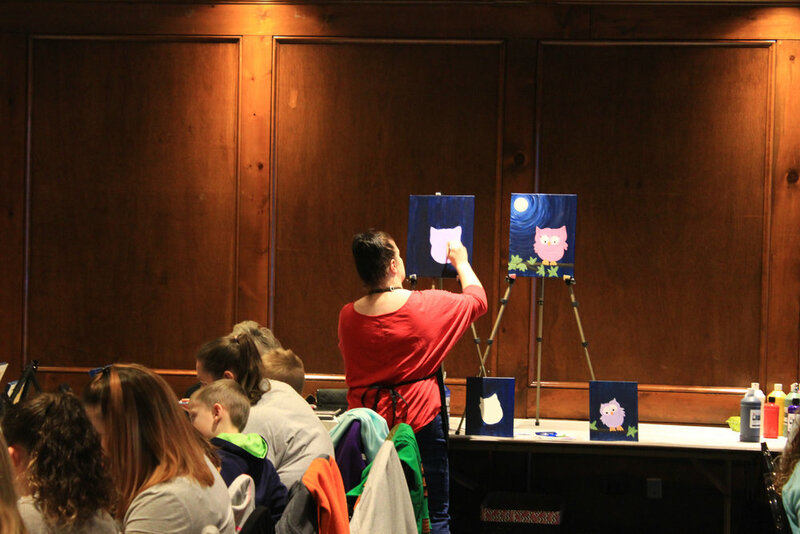 On Sunday, March 5, a group of adults and children enjoyed an afternoon of tea, hot cocoa and painting fun at Webb's Captain's Table for our Winter FUNdraising event to benefit the Mayville Library. Participants of this event were guided by local artist Kate Tarkowski of Cocktails & Color Chautauqua, who provided step-by-step instruction and all supplies required to replicate the featured paintings of the afternoon. Our artists of the day worked together to create two vibrant paintings featuring a friendly owl in the moonlight. We'd like to thank all who participated in this family-friendly event which raised over $280 for the Mayville Library. To view more photos from the day of the event, please visit the Cocktails & Color with Kids event feed on Facebook.